Whether we prefer the philosophy of Nietzsche’s “eternal recurrence of the same”, or David Hume’s logic, we cannot deny that the future will resemble the past. A visit to any major cosmopolitan European city will reveal a multitude of architectural styles that have been built over the centuries. The evolution of styles, like the latest fashions, often borrows from those of the past, though sometimes in subtle stylized forms. While residing in Paris last summer, a visit to starchitect Zaha Hadid’s architectural installation of the Chanel Mobile Art Pavilion, then situated in the courtyard of L'Institut du Monde Arabe in Paris, followed by dinner at the Laduree Bar on the Champs Elysees, brought surprising similarities to light. Not only did that day bring me to two fantastically designed sites, but it also sparked a passionate inquiry into this chance encounter of parallels in style. The interior of both locations gave the feeling of being enveloped in a web-filled cocoon. There was something so refreshingly different about these places in contrast to the stark rectilinear glass and concrete boxes , to which I have grown accustomed to in Vancouver architecture. 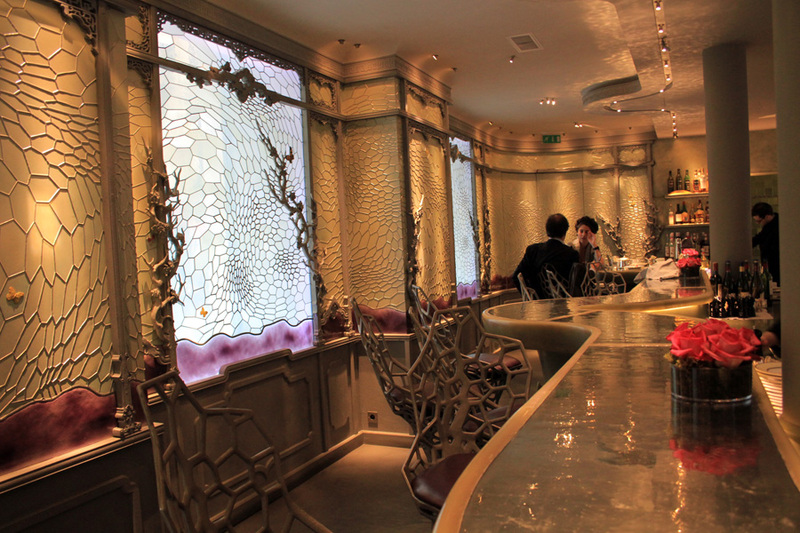 It soon occurred to me that both the designer of the Laduree Bar and the architect of the Chanel Mobile Art Pavilion (coincidentally both being women) had the same influence for their sinewy, organically influenced creations – Art Nouveau. The influence of Art Nouveau seems to be a growing trend crossing disciplines spanning architecture, interior design, furniture and fashion design. Of course this multi-disciplinary approach is quite fitting, as the original wave of Art Nouveau, circa 1890 – 1910 included architecture fine art and applied arts – furniture design, interior design, graphic design (posters), etc. The most prolific resurgence of this style exists in the creations of Iraqi-born, London-based architect, Zaha Hadid. In 2004 Hadid became the first female recipient of the Pritzker Architecture Prize, architecture's equivalent of the Nobel Prize. Though most noted for her strong, unique and futuristic architectural style, she has followed this multi-disciplinary theme, delving into the decorative arts. She has put her signature fluid style into architecture, furniture design, fashion items and household objets d’art, interior design, installation and sculpture. Zaha Hadid’s early architectural work began like an homage to the Suprematism of Malevich’s paintings. In these Suprematist inspired designed we can see the predominance of the strong, fluid whiplash lines that became a signature to the Art Nouveau movement. In more recent projects, the hard edges of her designs have softened, becoming more akin to the fluidity seen in the natural world. Recent advances in engineering and digital imaging software have enabled Hadid to match her vision of fluidity with actualized construction. Likewise, the development of iron construction during the nineteenth century in France enabled engineering of the fluid construction seen in Art Nouveau. Hadid’s dynamic designs increasingly come to resemble the organic forms found in nature. For example, in her design for the Temporary Museum - Guggenheim in Tokyo, her treatment of the building envelope is like that of an exoskeleton or skin “unified and animated by snakeskin-like pixilation”. She prefers to work with natural, rather than Platonic geometry, as seen in the dune-like design concept for “One-North Masterplan” for Singapore. Examples far too numerous to mention here include building designs in the form of waves (London Aquatic Center), shells and glacial formations (Nordpark Cable Railway), coral (Nuragic and Contemporary Art Museum), sand dunes (Dubai Opera House) starfish (Requiem Waterfront), and the trend carries on. Perhaps Hadid's most easily recognizable Art Nouveau influences are her designs incorporating tree-like branches and formations mimicking the human circulatory or nervous systems in sinuous, vein-like formations. The original designs of Art Nouveau were influenced by the new fields of science at the turn of the century, which included neurology, psychology, evolution, cell theory, microscopy and microbiology. The invention of the microscope opened a whole new world of seeing to artists of the time, as evidenced in their designs. Zaha Hadid’s degree in mathematics becomes evident in her very deliberate, almost spiritual approach to mathematics seen in her architecture. In a modern approach reminiscent to sacred geometry (the geometry often used in the design of churches and other religious structures) Hadid has thrown in an element of randomness that borders on chaos, more so than order. Nonetheless, her spaces still become a spiritual experience, as contemporary spirituality is based not on religious doctrine, but on a philosophy or set of philosophies that provide a sense of order to our understanding of the universe. Chaos theory is now seen as being more akin to the laws of nature and physics than the stringent laws of sacred geometry. This organic and plant-like style has made its way into the contemporary world’s most avant-garde fashion houses – most clearly evident in the fashion designs of Alexander McQueen and Hussein Chalayan. Art Nouveau influence can be seen in the teetering, vine-like or bestial high heels of Alexander McQueen. Hussein Chalayan buried his debut collection of gowns in dirt before they were worn on the runway. His organic approach to fashion design inspired famed fashion photographer, Steven Meisel, to pose supermodel Kristen McMenamy in Chalayan gowns, covered in blood, dirt and oil draped with a seaweed necklace, creating a fragile impression reminding us to be careful with our planet. 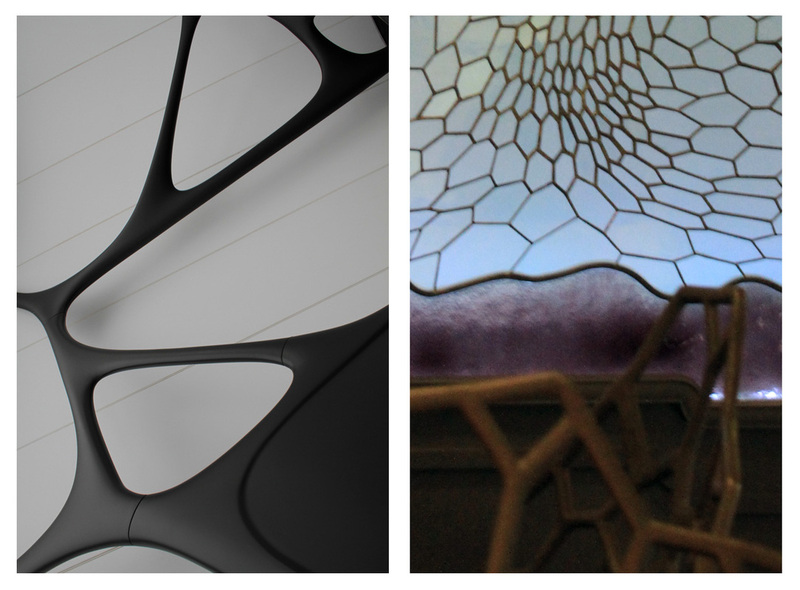 The resurgence of natural form and Neo-Art Nouveau is not isolated to any particular design type or singular city. Multi-disciplinary examples of this style can be seen in the States in projects such as the award winning Miami Beach Soundscape at Lincoln Park, designed by West 8, an international urban design and landscape architecture firm. Their vision involves the process of creating a “second nature” of constructed landscapes, as seen in their garden of Art Nouveau-like pergolas whose shape are inspired by the local climates cumulous clouds. Though reminiscent of a century-old era, just what is it that influences and makes this trend of organic form contemporary in fashion and architecture today? Perhaps like many movements, it is powered by a reaction against something else. Just as Art Nouveau was initially a reaction against the Industrial Revolution, it may be that its subtle resurgence is a reaction against the danger that we have put our planet in, through over-consumption, mass-production, pollution, construction of non-biodegradable products, raising food through artificial hormone-injected chemical laden means, destruction of our forests and oceans, and the artifice of the every day. Creating photographs out of a period of multi-disciplinary research, ranging from fashion to fractal geometry to parametric architecture, I can conclude that style does indeed follows theory, at least for Zaha Hadid. Wearing gowns that I commissioned by the young, latent fashion designer, Molly Graham, I have inhabited the interior landscapes in a fashion that reveals the artistic movements of their philosophical origins. My soft, feminine gestures postulate the femininity and fluid integration of their environments. Far be it from me to claim that the future is organic. While organic form seems to be a contemporary multi-disciplinary trend, their greatest relationship to nature is simply cosmetic. And, while appearing avant-garde and futuristic, having returned from the past, so it will too again become a trend of the past. The past, present and future are cyclical in occurrence. Betsky, Aaron, Patrick Schumaker, and Zaha Hadid. Zaha Hadid Complete Works. New York: Rizzoli International Publications Inc., 2009.
http://www.west8.nl/projects/parks/miami_beach_soundscape/, West 8, Miami Beach Soundscape, 2011. Benjamin, Walter. The Arcades Project. Massachusetts and London: The Belknap Press of Harvard, 1999.